Fifteen minutes prior, a downpour filled up the roads in the area, and it was still raining when we crossed through the final puddle to get to the school where we’ve made a loan to fund new classrooms and computer labs. The water came to halfway up the tire on the motorcycle taxi I was riding. I picked up my feet just to pretend I was being wise, knowing that my shoes were already wet. I walked in at 10 minutes after two o’clock. The director greeted me. Two hundred students were missing from school that afternoon. “Maybe it’s the rain?” I asked. The director responded, “Maybe, but there’d at least be a few.” “Well maybe there’s an event going on that we don’t know about?” That was just a wild guess, I don’t know the local community news. I arrived here to work on a project in our micro-lending program that helps improve the quality of education for schools in the rural area. As we were sitting down chatting, a young man walks in the door holding a huge sign about a march against violence and crime in the sector where we are currently located. He tells us that every student from just about every school is probably at the afternoon event which is to start in about 30 min. They won’t be coming in this afternoon. “So the violence is pretty bad in this area huh?” I ask. 1) By Dominican law, all employees public or private should receive a double salary in December. So, there’s generally more money moving around in the economy, and therefore more targets for theft and robbery. 2) Everyone wants to provide gifts for their family and make purchases during holiday discounts, or at least to have something to give their children. (Christmas time here is the only time most people make non-essential purchases.) Lack of economic resources encourages some people to rob, steal, or prostitute themselves to get more income for Christmas. I wanted to launch into a discussion about the economic realities faced by the inhabitants of this local area, but Aleyda interrupts me. She looks at my shoes. She sees that they’re wet. I told her it doesn’t bother me. It does, but given this current situation, it feels trite to mention it. She’s looking me over and something strikes her, she says, “Wait, have you eaten lunch?” I respond no. She asks one of the teachers to make me some food, ASAP. Her change of focus tells me that a woman like this, living in such a difficult area, focuses on the immediate practical responses she can take and less on moping about the rain or lack of students. How many of us would focus on whether one person had eaten when they are missing over 200 students? Aleyda has built her foundation on a solid rock in such a shaky place like this. With the violence and unrest in a poor neighborhood, the tremendous downpours, the lack of government assistance in the schools, and not to mention trying to keep order in a school of 440 kids, she’s got a lot on her mind. But somehow she is at peace. She’s more concerned with the immediate, she checks again to see where we are with the food. 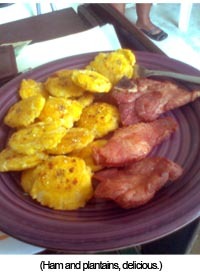 The fried plantains and ham come out. It’s been six hours since I’ve eaten and this hot food warms me up. I realize my feet are still wet because of that “river” we rode through to get here. I make a practical decision. I’ll change into my sandals when I get to the bus. (Yes, I still wear sandals here in November.) I feel better mentally. Aleyda gets up to help someone use the computer lab. Oh, I forgot to mention this, she used part of her loan to create a computer lab for her high school and when it’s not in use it becomes an internet center in the community. People can come use the computers here for about 50 cents an hour. The money she makes from the lab pays her monthly loan amount. She is, by all sense of the words, an entrepreneur and a dynamo. I finish the meal and we chat for a bit longer. The rain stops. It’s time for me to go. “Vaya con Dios,” she tells me. “Go with God” is a common phrase to say goodbye in Spanish, but I believe that in her case, she speaks from experience; a personal history, a relationship with the Lord that has walked with her through 16 years and a daily journey with 440 students, hurricanes and rainy afternoons, in the second-poorest community in her city. He’s straightened even the most windy, rocky, muddy roads in her life and left her with enough peace and energy to make sure a tired, soaked, traveler gets a meal at 2:30 in the afternoon. I hope you are enjoying the Christmas season and that your roads are getting easier to travel as we get closer to Christmas. *Update: I have been writing “thank you” letters to you all from the Dominican Republic for this past year. I hope you get yours in time for Christmas. 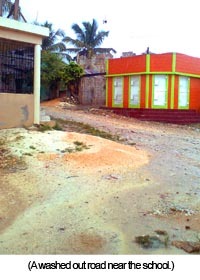 I’ll be sending an email about coming back to the Dominican Republic in January in a few weeks. Do pray for the work of HOPE and if you feel led to support me financially, you can find that information here. 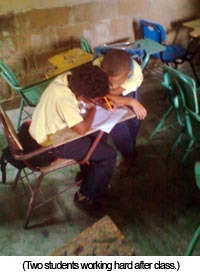 This entry was posted in Dominican Republic, HOPE International, Monthly Newsletter on December 23, 2011 by Aaron. I have been traveling for about 16 months through Central America and the Caribbean, most recently in the Dominican Republic, where I’ve visited a good part of the country working for an NGO called HOPE International. We provide microloans and small business training to the communities shown in the pictures I’ve taken. Everyday, I’m consistently amazed at the vibrancy and style of this Latin American culture of a tiny Caribbean island that boasts one of the most staggering poverty rates in the developing world. Nearly 42% of the population lives below the poverty line, and its neighbor, Haiti, is considered the poorest country in the western hemisphere. My aim is to capture the beauty found in the extremes of the stunning natural beauty and in the crushing poverty to show that there is beauty in all areas of life here. The theme of my photo book will be “Beauty in the Extremes” and I’m hoping to portray the resilience and hope found in the people in the midst of their economic struggles of living on just $2-3 dollars day in one of the most beautiful places in the Caribbean. You’ll also see pictures of lush tropical vegetation, crystal blue waters, brilliant white sands, and majestic towering mountains covering the natural landscape. But also, Haitian communities where men and boys, cut sugar cane 10-12 hours a day for a few dollars, tiny concrete houses with iron bars stacked upon each other in city ghettos, smiling moms with missing teeth and tattered clothing, with well-dressed, well-fed children, and kids playing baseball with discarded water jug caps. Since I’m volunteering full time with a Christian microlending organization I’ll be able to capture more remote rural areas where photographers don’t usually go. I also speak Spanish fluently which will help me connect face to face with the people I meet. I’m planning an in depth tour through the colonial area of the 500 year old Santo Domingo with its cobblestone colonial streets, Spanish style haciendas, early conquistador architecture and early American colonization. I’ll hitch rides on public transportation to capture the destruction derby-like highways of rush hour, half-demolished overcrowded buses with teenage boys hanging out of the side where the sliding door used to go, and the food/wares/imports markets of pure insanity. You can follow my progress on the photo blog called: “Beauty in the Extremes.” throughout the year. I’ll continue to be working in the communities helping with our microlending program and small-business training as I travel. I’ll be updating the titled galleries shown in this post and compiling the photos for my upcoming photo book printing in 2012. Here is the link to the Kickstarter fundraising page. 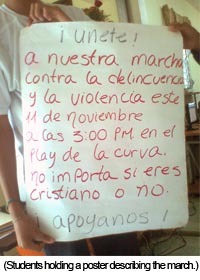 This entry was posted in Dominican Republic on December 5, 2011 by Aaron. This particular case with the man mentioned above was like many of the 115 patients we saw that day and the 110 the day prior. Most of the patients had significant pain in their stomach and were unable to eat well, or if at all. It was the hardest thing to look into the eyes of a child when he says to you “My tummy hurts.” And he rubs his stomach trying to make it better. Doctor VanLue’s reassurance was comforting, and we were able to give every family that walked through the door the medicine to kill the parasites, and spent time talking with them about proper food preparation and the importance of clean water. “Oh honey, don’t worry. All seven of them are my children, and I know what’s wrong with them, I’m their mother. If you don’t remember, I will.”She smiles in response to my concern. She’s been a microfinance client for six years. She and her husband run a successful business selling fruit to the local community. He’s currently working the double-shift so she can take children to the clinic that we brought into the mountains. I guess I’m taken aback at this situation. Normally, if I would have seen this woman during a microfinance meeting it’s all business, smiles, and a few prayer requests, much like a weekly small group Bible Study meeting. But its different now, she’s let me in to her life because I’m the doctor for the day. She tells me that two of her daughters may have Sickle Cell Anemia, a red blood cell deficiency that can be deadly later on in life. Doctor VanLue tells me that this is difficult to treat in the States, hopefully they just have Anemia, which is a much less dangerous illness caused by poor nutrition. My assistant, (the real Doctor VanLue,) is up fetching medicine from our pharmacy. Our driver walks up to me and says that the roads are so muddy here in the mountains that if the rain continues for another 15 minutes we are going to have to leave or we’ll be stuck here. I look at him, then at this woman with seven children, and then the 40 people in our waiting room, a small school converted into a clinic. I want the rain to stop. I want to make sure we can see everyone. Doctor VanLue returns with the medicine for the seven children, the mom and the dad. I carefully go over the instructions for the nine prescriptions, reaffirm health instructions for preventing parasites, and how to use the shampoo for lice. I ask her if I need to repeat it. She responds, “I’m the mother, remember?” I laugh and we pray a small prayer for the family. The real Doctor VanLue thanks her for her visit. It all strikes me at the same time. The two daughters with Anemia. The pounding rain on the roof. The women with their children waiting to see us. The muddy roads getting muddier. The smiles on the Doctor’s face and the rest of the family we just visited. The real doctor is thanking the patient for her visit. Wow. I’m amazed and inspired. It’s people like Doctor Scott VanLue, and women like the one we just visited that renew my vision for what this world can be, a world where the living God still moves and works where we think it’s hopeless. The rain begins to calm down. I’m smile when I think about what she told me. The Doctor is right. Sometimes it’s just the seat you sit in that brings you closer to the work of God. Your location can help you become a doctor, a microfinance practitioner, or just a messenger bringing the good news of God’s work abroad. I pray for the seat you sit in, and that God would scoot you a bit closer to His work where you are right now. This entry was posted in HOPE International, Monthly Newsletter on December 1, 2011 by Aaron.